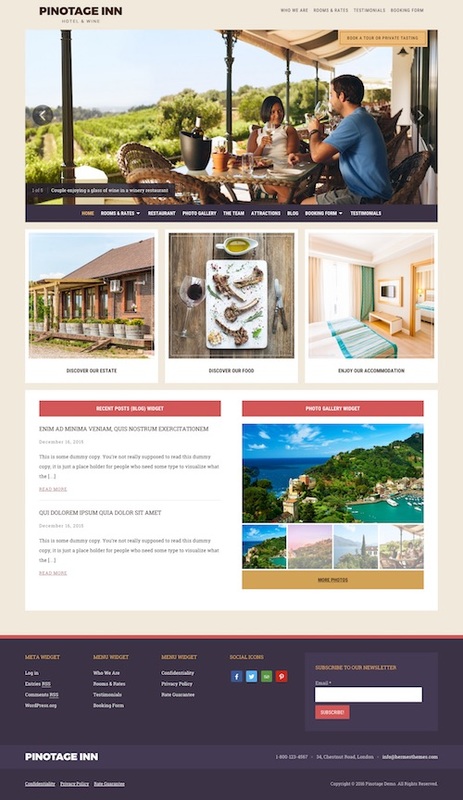 This is a collection of the best hotel WordPress themes designed for resorts, B&Bs, motels, guesthouses, lodges, vacation rentals, apartment rentals, hotels, and other accommodation and other hospitality websites. If you need to build a hotel or accommodation website with WordPress, these premium themes will allow you to build a professional looking hotel website quickly, easily and cheaply. The themes below have been designed purposely for hotel and accommodation websites, with some including specific accommodation features such as online booking / reservation systems, custom templates for showcasing rooms, photo galleries and other elements required in a hotel website. Others are more general and flexible in their design allowing you to easily customize and add functionality to suit your needs. This is a dynamic collection that’s updated with new themes as they’re released, so be sure to bookmark and check back. 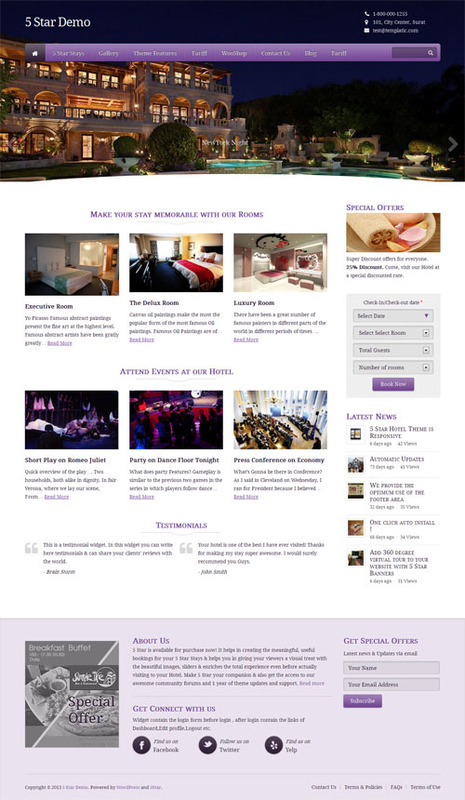 If you know of any other hotel and accommodation WordPress themes we have missed, please let us know. 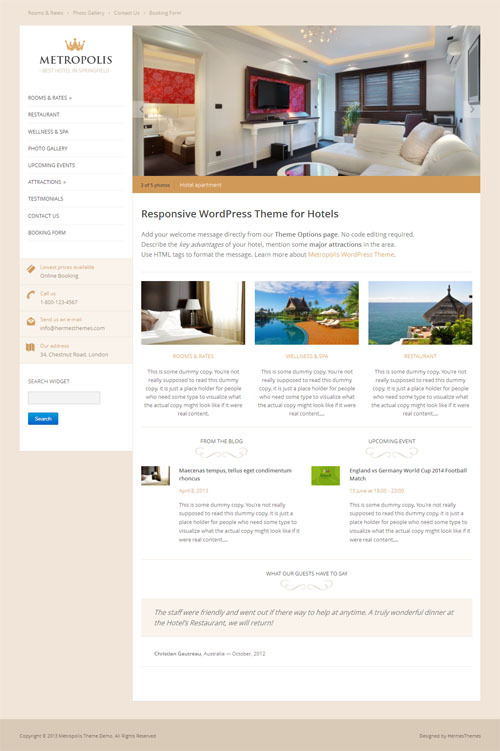 Andos is a hotel or resort WordPress theme from CSSIgniter. The premium theme has a very stylish and modern design and lots of customization options so you can showcase your hotel or resort in style. It allows you to easily integrate your favourite external booking service. 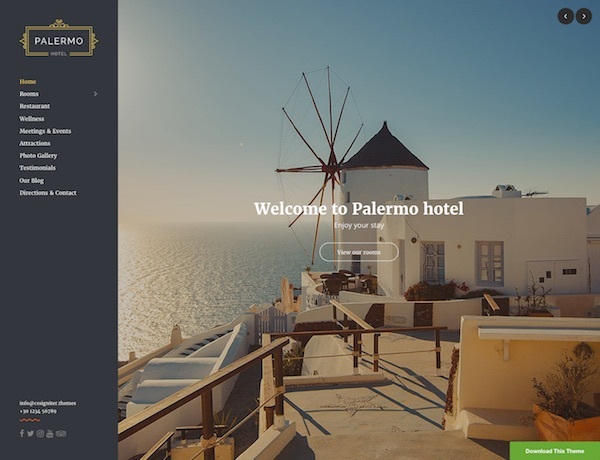 Palermo is a beautiful responsive WordPress theme designed specifically to showcase your hotel, resort, B&B, lodge, guesthouse, hostel, villa or other venue. The premium theme from CSSIgniter has a stylish minimalist design and comes with lots of customization options, comprehensive room meta for rooms, slider, full page backgrounds, page builder compatibility and more. 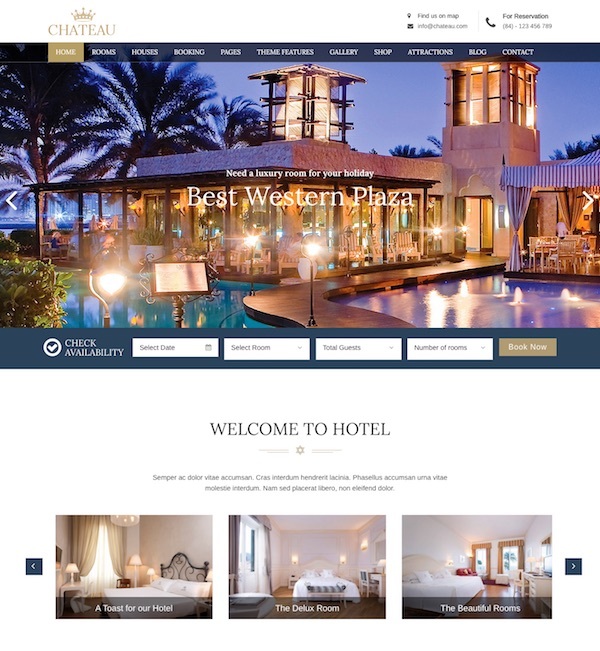 The Prestige Theme is a modern and elegant WordPress theme designed for hotels, resorts, resorts, guesthouses, boutique B&Bs, vacation villas, and other accommodation websites. The premium theme from Hermes Themes could be used for a single hotel or a chain of hotels as its structure allows you to easily display information for multiple properties. It features a powerful live customizer for easy customization with unlimited combinations of styles, fonts and colors. It comes with a mobile responsive layout, multilingual support, custom page templates (for rooms, photos, nearby attractions, testimonials, etc). 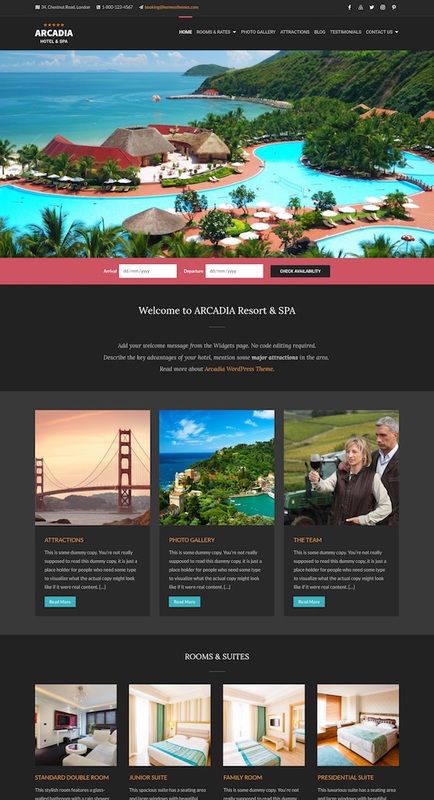 Arcadia is an attractive hotel WordPress theme from Hermes Themes. The premium theme has a bold, modern and mobile responsive design specifically developed for hotels, resorts, B&Bs, vacation rentals, motels and other accommodation websites. It comes with 3 pre-made color schemes, an optimized mobile responsive design, easy reservation system integration, support for popular plugins such as WPML, The Events Calendar, Gravity forms, beautiful room details pages, photo gallery and more. Zermatt is a beautiful hotel and resort theme for WordPress. The premium theme from CSSIgniter has a next generation, mobile responsive design that’s been specifically designed to showcase your hotel or resort in style. It has lots of great features built-in as well as customization options so you can easily build a unique and professional website for your hotel. Some of the key features and benefits include: a fully customizable widgetized homepage (to easily create a unique layout for your homepage via drag and drop), full page video or normal slider for your homepage, rooms widget with multiple layouts, comprehensive room meta information (room’s amenities, gallery image, price etc), 7 custom post types (rooms, services, attractions, galleries, videos, testimonials and slider), WordPress customizer (for easy customization), infinite color customization options, weather module, custom widgets, booking form, translation ready, and more. 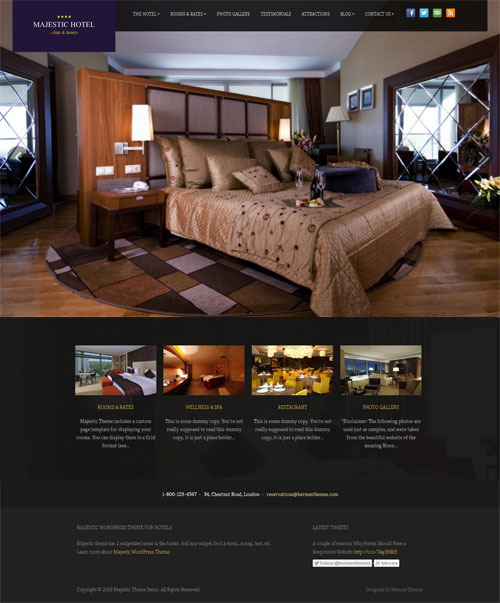 Olympus Inn is a really professional looking hotel WordPress theme from cssigniter. The premium theme has a mobile friendly responsive design and is specifically designed to showcase your hotel, resort, B&B, inn, vacation rental or other accommodation type. 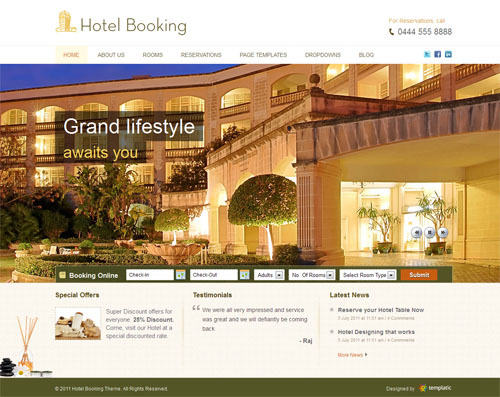 The theme allows you to integrate your favourite booking system or use the unbuilt booking form. Other features include: custom homepage with big features slider, dynamic weather reporting, galleries, attractions, room templates, testimonials, multilingual plugin support, user friendly options to change colours element displays and more. 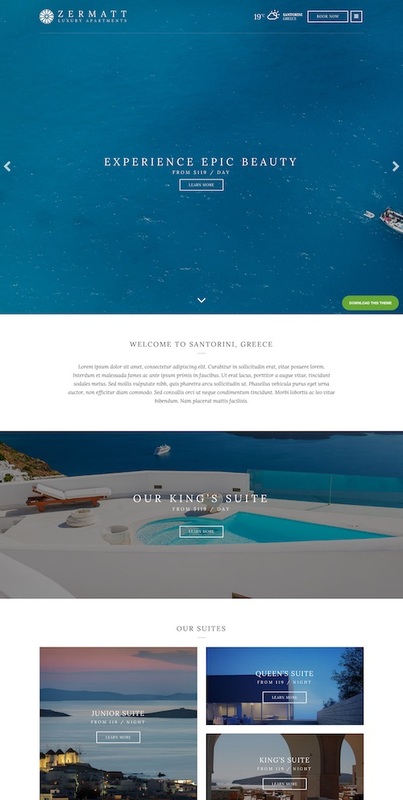 Santorini Resort is a professional and beautiful WordPress theme designed specifically for hotels and resorts. The premium theme from cssigniter has a responsive and retina ready design so it automatically adapts to look great on all computers, tablets and mobile phones. It has a clean and modern design and all the accommodation specific features you need built-in to really showcase your hotel or resort in style. 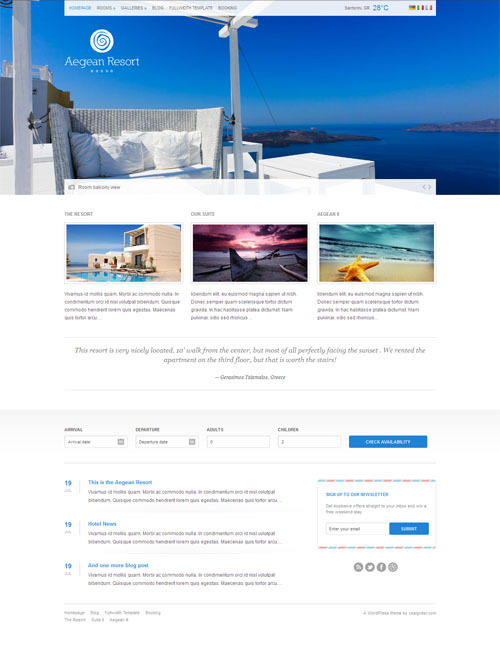 Some of the other key features of the Santorini Resort theme include: a booking inquiries form and option to integrate your favourite booking system, dynamic weather reporting, rooms templates, photo galleries, attractions, testimonials, powerful options panel and customisation options, 8 colour schemes, shortcodes, HTML5 / CSS3 code, multilingual plugin support and more. Sun Resort is a modern and stylish hotel WordPress theme specifically designed to showcase your hotel or resort in style. The premium theme from CSSIgniter has a bold homepage with big featured slideshow background and sections for your welcome message, rooms, hotel information and booking form. The homepage is drag and drop so you can build the homepage layout exactly the way you want via custom content widgets. Some of the other features of the theme include: multiple color schemes, custom room page templates, fully integrated booking request form, custom widgets, flexible layout, theme options via WordPress customizer, translation ready, retina and mobile friendly responsive layout, SEO and speed optimized and more. A beautiful responsive hotel WordPress theme from cssigniter designed specifically to showcase your hotel, motel or resort in style. The theme has a mobile responsive design so it works great on all devices and screen sizes such as iPads and iPhones. Other features include numerous template layouts (2 or 3 column, left or right sidebar etc), booking form, photo galleries, room template, shortcodes, theme options panel and more. 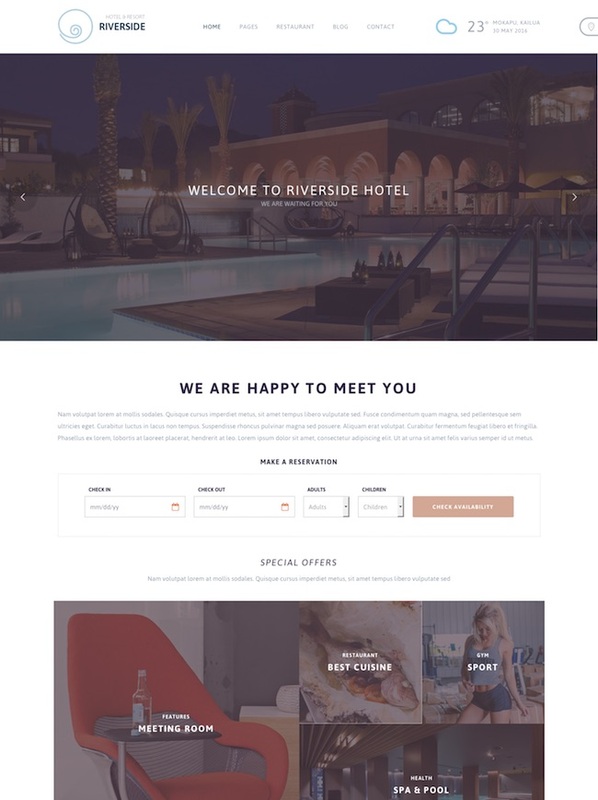 Riverside Resort is a professional WordPress theme designed specifically for hotels, resorts, B&Bs, hostels, guesthouses, motels and any other hospitality and accommodation website. The premium theme from Tesla Themes has a stylish and versatile design that would be suitable for all types of hotels. The theme includes all the features and functionality you would need in an accommodation and hotel website including: inbuilt booking / reservation features, useful custom pages for events, rooms, spa, meetings etc, and full control for the room pages, bookings, room types, room facilities, pricing options and settings. Some of the other features include: a fully mobile responsive design, comprehensive theme options, wide or boxed layouts, visual page computer, homepage slider, latest HTML5 and CSS3 coding, Google fonts, weather widget, Google fonts, unlimited color options and more. Pinotage is a mobile responsive WordPress theme designed for wineries, inns, hotels, resorts and similar websites. The premium theme from Hermes Themes has a professional and modern design that’s clean and simple which makes it very functional and easy to use for sites with lots of content or only a little amount of content. Some of the key features include: room and rates templates, room type template, custom templates for attractions and photo galleries, customization options (fonts, colors etc), easy hotel reservation system integration, multilingual support and WPML ready, optimized for mobile viewing, compatibility with popular plugins ( The Events Calendar, Gravity Forms etc), search engine optimized for speed, and more. 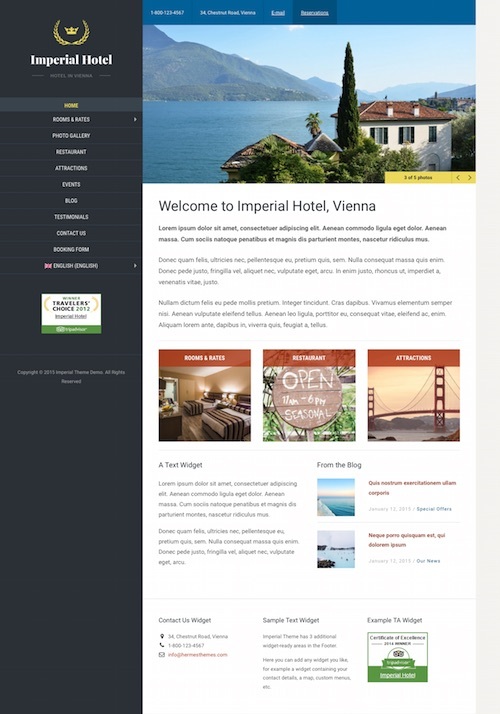 Imperial is a mobile friendly hotel WordPress theme from Hermes Themes. The premium has a modern and intuitive layout specifically built for hotels, resorts, villas, B&Bs, holiday rentals, inns and other accommodation websites. Some of the key features of the Imperial hotel theme include: a mobile optimized responsive design, customization options (colors, fonts, etc), custom room and rates templates, room type template (for displaying information about your rooms and included amenities), photo gallery, attractions page template, testimonials, events calendar compatibility, multi-lingual ready, theme options panel, custom widgets, search engine optimized and more. 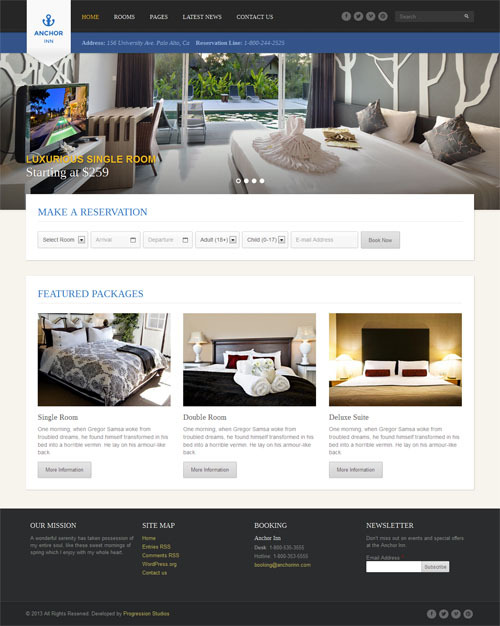 PE Hotel is a hotel and resort WordPress theme from Pixel Emu. The premium theme is ready solution for any hotel, motel, resort, guest house or other accommodation website. It has a modern and professional design that follows the latest trends in web design and has is packed with all the features and functionality you need in a hotel WordPress theme. It has attractive room listing pages with detailed room details and amenities, restaurant menu, booking form, blog section, Google maps, mobile responsive design and more. Bordeaux is a premium WordPress theme designed for hotels and wineries. The theme from Hermes Themes has a classy, modern and bold design that optimized for mobile devices. Its ideal showcasing your winery or hotel in a website with big photos and great typography that will ensure to create a lasting impression. Some of the key features of the theme include: custom widgets so you can create a unique custom homepage, room and rates template, customization options (change colors, fonts etc), support for popular plugins (WooCommerce ecommerce, WPML, The Events Calendar, Gravity Forms), attractions page template, testimonials template, theme options page, search engine optimized for speed, easy to integrate hotel reservation systems, theme options page and more. 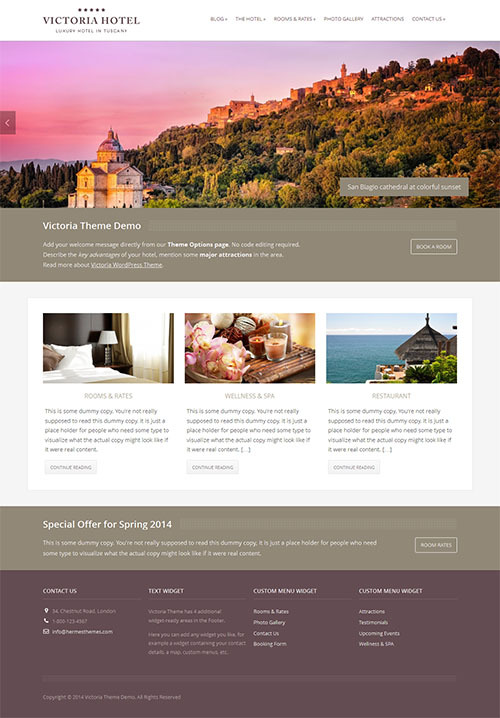 The Chateau WordPress theme from Templatic is an attractive hotel and resort theme with booking functionality. 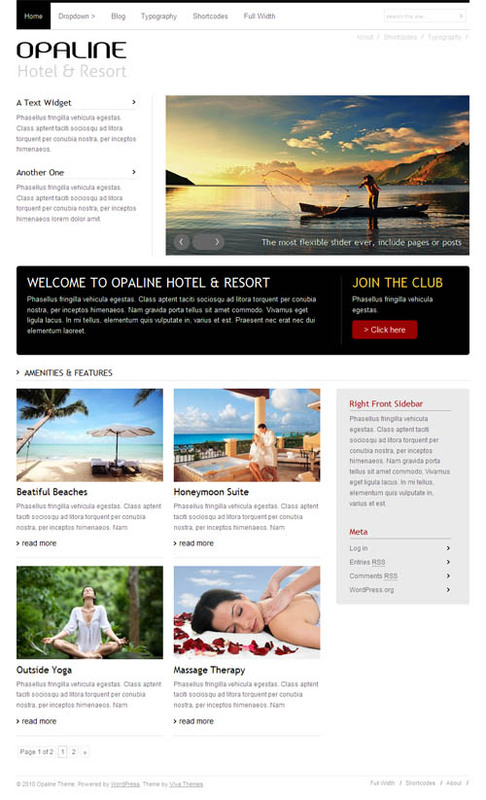 The premium theme could be used for hotels, villas, resorts, rental accommodation, and other hotel industry websites. It used the Tevolution and Booking plugins for functionality and comes with a lot of handy features. Features include: a dedicated mobile app view, detailed room pages, various homepage layout options, customization options, detailed online booking functionality, and more. 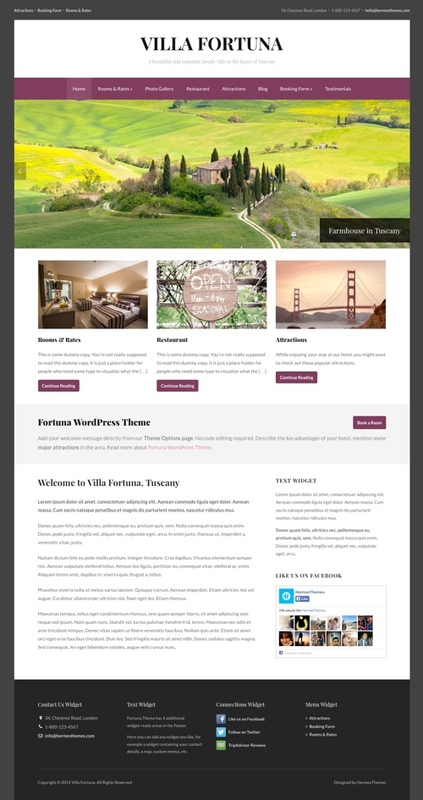 Fortuna is a hotel and accommodation WordPress theme ideal for resorts, villas, hotels, inns, B&B’s, holiday rentals and other establishments. The premium theme from Hermes Themes has a modern, fresh and bold flat design that is mobile friendly with a fully responsive layout. It works perfectly on iPhones, iPads, Android devices and of course will look great on large high resolution monitors. Some of the key features of the theme include: light and dark colour scheme options and well as custom colour and font options via the WordPress theme customizer, custom page templates for room lists and room types, options to display rates and amenities for each room type, theme options page, easy customization options, automatic image resizing, photo gallery, featured images for pages and posts, testimonials module and more. 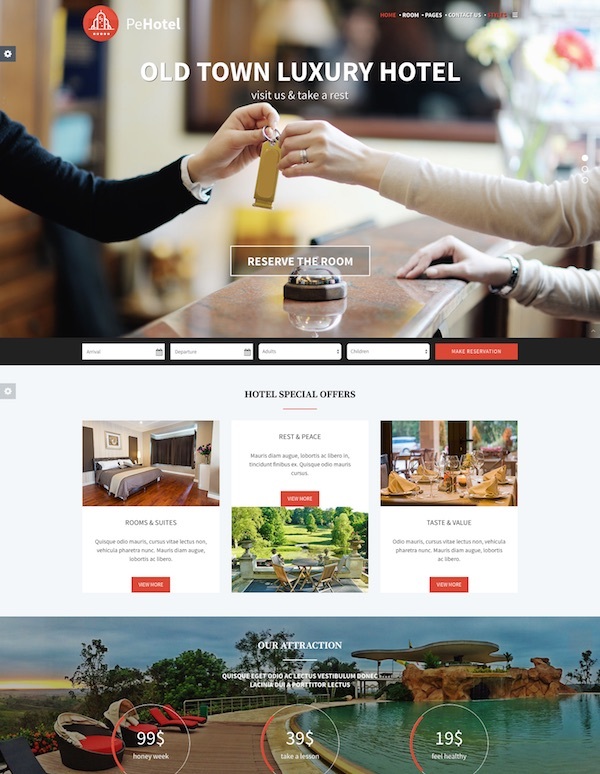 Belafonte is a mobile responsive WordPress theme for hotels and resorts. The premium theme from Hermes Themes has a modern and minimalist design ideal for properties that want the focus to be on the photographs of the hotel or resort. 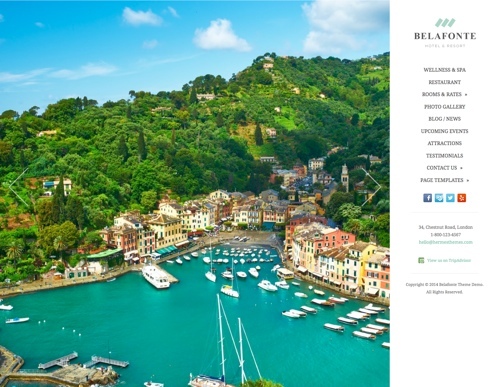 Belafonte would be perfect for luxury resorts and hotels, rental villas, boutique hotels, B&Bs and others. Some of the key features of the theme include: a nice big photo slider on the homepage, custom room and rates templates (grid or list layouts), photo gallery template, testimonials template and a section for information about attractions around the hotel or city, events module, various custom widgets, WPML compatible and localized for translations, social media integration, and a theme options panel so you can easily tweak the themes settings. It has a special page template for a quick and simple booking form or you can use a third party plugin for a comprehensive online booking system. Victoria Theme is a professional and modern hotel WordPress theme that’s optimized for mobile with a responsive design. The premium theme from Hermes Themes is perfect for a big or small hotel, resort, villa, inn, B&B, lodge, holiday rental, or any other type of accommodation website. The theme has custom room and rates templates (grid or list layouts), photo gallery template, testimonials template and a section for information about attractions around the hotel or city. Some of the other interesting features of the theme include: an events module, various custom widgets, WPML compatible and localized for translations, social media integration, and a theme options panel so you can easily tweak the themes settings. It has a special page template for a quick and simple booking form or you can use a third party plugin for a comprehensive online booking system. Splendor is a hotels directory WordPress theme that allows you to create a powerful and professional hotel directory portal website. Splendor is a child theme for the Directory theme from Templatic which is a powerful and feature rich directory framework. With Splendor you can build a modern and great looking directory website for hotels, motels, bed and breakfasts, rental accommodation, holiday and vacation rental villas, apartments or any type of accommodation directory. Some of the key features of the Splendor theme include: modern homepage layout options (with map or slider), advanced search functionality, user submission and monetization options, 3 category page layouts (Grid view, List view & Map view), custom accommodation page layout, color customization options, Google maps, ratings and reviews, Google fonts, dedicated mobile app view, use for local or world wide accommodation directory, translation options, create your own custom fields, users can manage their own listings, compatible with popular WordPress plugins (Gravity Forms, WooCommerce, Yoast SEO, Rich Snippets etc), support for various payment gateways, lots of advanced extensions available and more. 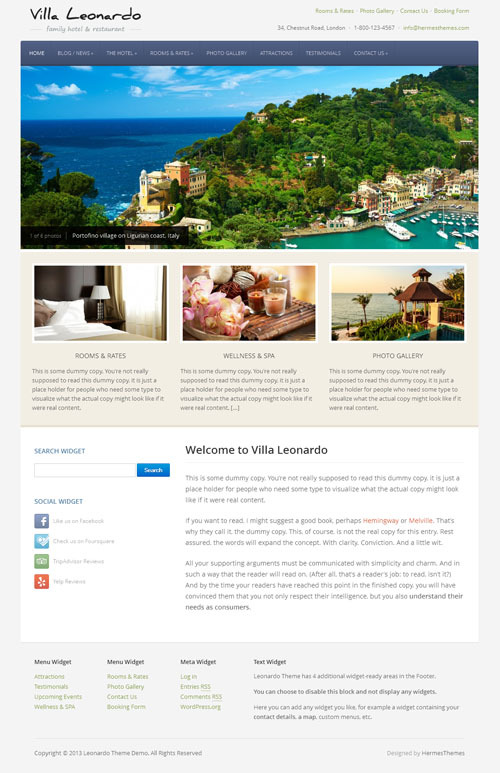 Leonardo is a modern hotel WordPress theme with a mobile ready responsive layout. The premium theme from Hermes Themes is suitable for any hotel, resort, guest house, motel, bed and breakfast, holiday apartments or other type of accommodation website. Features include a nice custom homepage with featured slider and sections for other introductory content. It has custom templates for rooms and rates, photo gallery, testimonials, nearby attractions and events. Social Media is integrated so you can connect with your customers through Facebook, Twitter, LinkedIn, TripAdvisor, etc. It has a 15 pre-made colour styles, is ready for translation and multiple languages and has a theme options page for easily tweaking the settings. Paradise Cove is a premium hotel WordPress theme from ThemeFuse. The professional theme has a modern and attractive design suitable for all types of hotels and resorts. Its mobile friendly with a fully responsive design that ensures it works and looks great on desktops, laptops, tablets, mobile phones and all other mobile devices. The Paradise Cove theme has been purpose built for hotel and accommodation websites and includes some great hotel specific features. The custom homepage allows you to display important information about your hotel up front, while custom page templates are provided for rooms, amenities, services and location. You can choose from 3 different slider styles. The theme also has a reservation module so guest can make reservations. Some of the other features include: photo and video galleries, blog section, weather widget area, powerful admin options, custom fonts, shortcodes, custom widgets and more. The Ambassador is a professional looking hotel WordPress theme from Hermes Themes perfect for hotels, resorts, B&B’s, and other accommodation and business websites. The theme has clean, light design which would be suitable for any number of hotels. The theme includes custom page templates display your rooms, nearby attractions, photo galleries and other information. A Testimonials module allows you display feedback from previous guests. Some of the other features include: a theme options panel to easily tweak the themes settings, automatic image resizing, social media integration, custom widgets, localization and translation options for different languages. The theme is also mobile friendly with a responsive design so its accessible and will look great on all mobile devices and screen sizes. Sixty One is a professional and classy hotel theme for WordPress with a mobile ready responsive design. The premium theme from cssigniter is ideal for resorts, hotels, bed and breakfasts (B&B) and other accommodation websites. The Sixty One theme is incredibly flexible and you can select your sidebar layouts, how many columns you want for your room pages or galleries and more. It has a number of custom templates specifically for hotel websites including a booking template, location template with map, amenities, contact and gallery templates. It also has a custom template for rooms which displays a slider of room pictures, list of room features and other information. Sixty One is built on a flexible foundation grid with a responsive layout so it’s mobile ready and will work and display perfectly on all monitors and mobile devices. Cityinn is a hotel WordPress theme with a fresh and modern mobile friendly design. The premium theme from 7Theme is built specifically for hotels, B&Bs, resorts, guesthouses, motels etc and includes all the functionality you need for a fully featured hotel website. It allows you to present your accommodation, your services and provide the ability for guests to book your rooms. Some of the key features of the theme include: an AJAX powered booking system (display real time availability check and manage reservations), customization options (change all colours, fonts, backgrounds, logo etc), easy drag and drop slider, 600 webfonts, unlimited slideshows, sections, portfolio galleries, custom room template, one click demo content installer, HTML5 and CSS3 optimized code, retina ready, admin options panel and more. 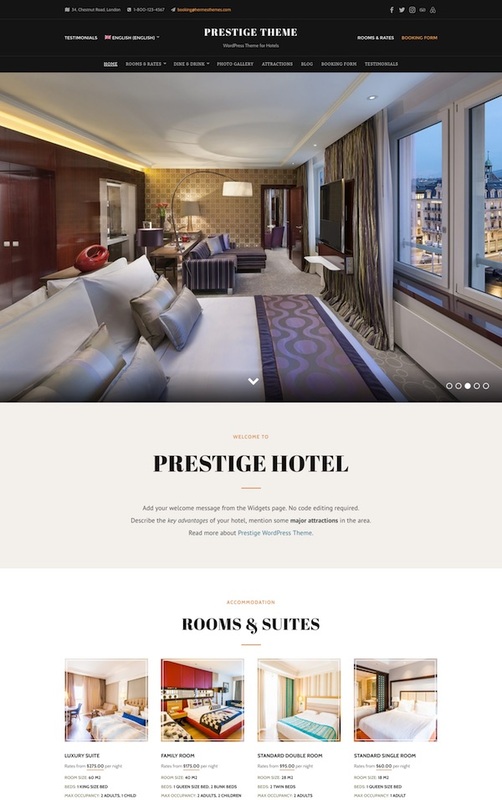 A premium hotel WordPress theme from CSSigniter. The theme is suitable for hotels, resorts, bed & breakfasts, lodges, or other accommodation websites. Features include a full width slider on the homepage, booking form, room pictures carousel, custom accommodation / room page template and more. Homepage Slider – a full width slider with its own custom post type. 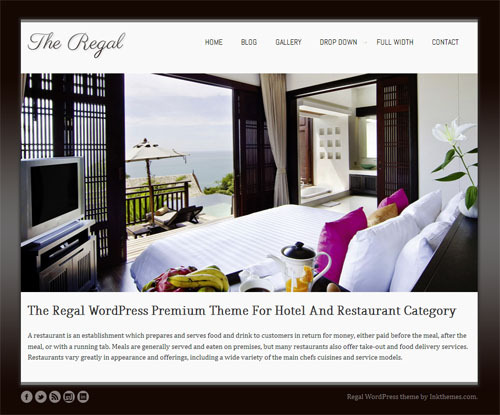 An elegant hotel WordPress theme with a mobile ready responsive design. The premium theme from Hermes Themes is perfect for small to large hotels, B&Bs, guesthouses, resorts, spas, convention centres and other business and hospitality website. A modern and professional business WordPress theme from ThemeFuse. The theme comes in 3 different styles making it suitable for a hotel, resort, bed & breakfast, lodge, health & beauty spa, or any other business website. Features include a pricing page for rates, multiple page templates, shortcodes, homepage slider, powerful admin options panel and more. 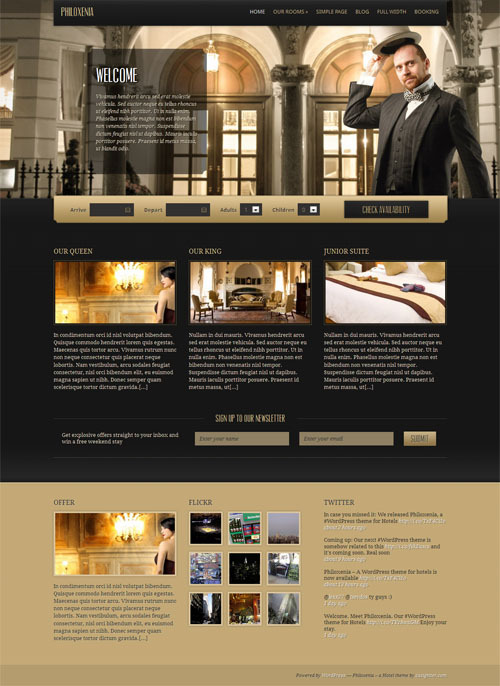 Royal Chateau is a responsive hotel WordPress theme from Hermes Themes. The premium theme has a clean and professional design ideal for resorts, spas, hostels, hotels and other small and medium sized business websites. The theme includes custom page templates display your rooms, nearby attractions and other information. A Testimonials module allows you display feedback from previous guests. Other features included in the theme are: a theme options panel to easily tweak the themes settings, automatic image resizing, social media integration, custom widgets, localization and translation options for different languages. The theme is also mobile friendly with a responsive design. Hotelia is a premium hotel WordPress theme with a mobile friendly responsive design from Tesla Themes. The theme has a modern, clean and elegant design suitable for hotel and resort websites, motels, travel and accommodation booking sites, and even travel blogs. The Hotelia theme is built on the robust Tesla Framework and has a complete set of powerful features and premium plugins to power your hotel website. Some of the key features of the theme include: custom homepage and room pages, booking system (powered by WooCommerce), premium Visual Composer plugin (for drag and drop page building), Revolution Slider, stylish effects (video backgrounds, parallax effects, elegant transitions, hover effects etc), font icons, Google web fonts, sticky navigation menu, and the powerful Tesla Framework options which allow you to easily customize the look and functionality of your theme, without advanced knowledge of programming. 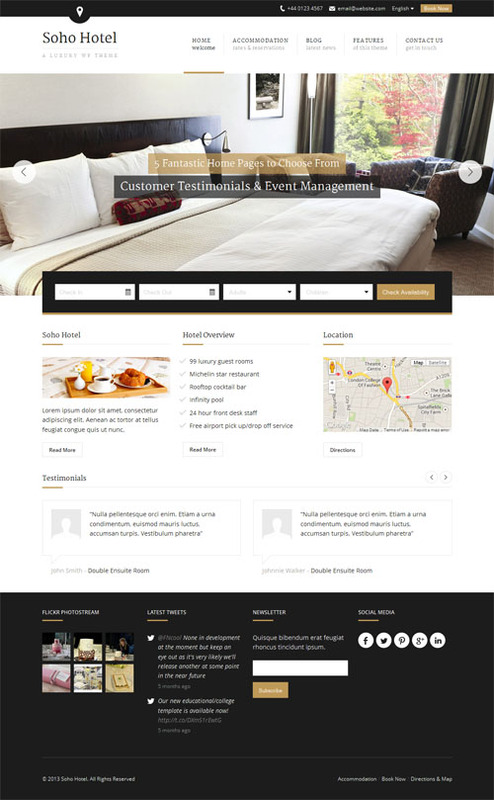 A business WordPress theme from Templatic designed specifically for accommodation and hotel websites. The theme includes booking and reservation management functionality as well as seven integrated payment gateways which can all be managed and customized by a backend admin options panel. Other features include 5 different colour schemes, design setting panel, 8 page templates and more. 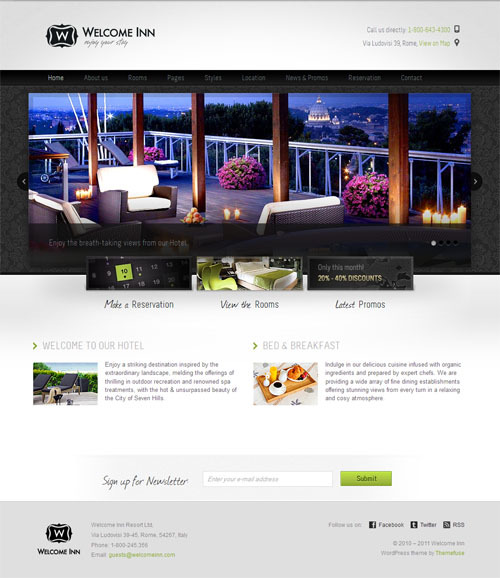 An attractive and professional looking hotel WordPress theme from Templatic. The premium theme provides a complete solution for hotel and accommodation websites with extensive room management, booking, reservation and payment functionality. It’s also mobile ready with a responsive design that automatically adjusts to work on all mobile devices such as iPhones and iPads. The theme would work nicely for any hotel, resort, hostel guest house, B&B, or a vacation home and apartment booking website. A professional, minimal WordPress premium theme from Viva Themes. The theme could be used for hotels, resorts, regional tourist area website, business sites or almost any kind of website. Features include a flexible slider and many widget ready sections on the homepage, post thumbnails, custom menus and background, theme options panel and more. A unique premium WordPress theme with a responsive design from Ink Themes. The theme could be used for a business website, portfolio website, personal website, hotel website, wedding website or anything else you can imagine. Features include 8 colour scheme options, gallery template, multi-use slider, theme options panel and more. 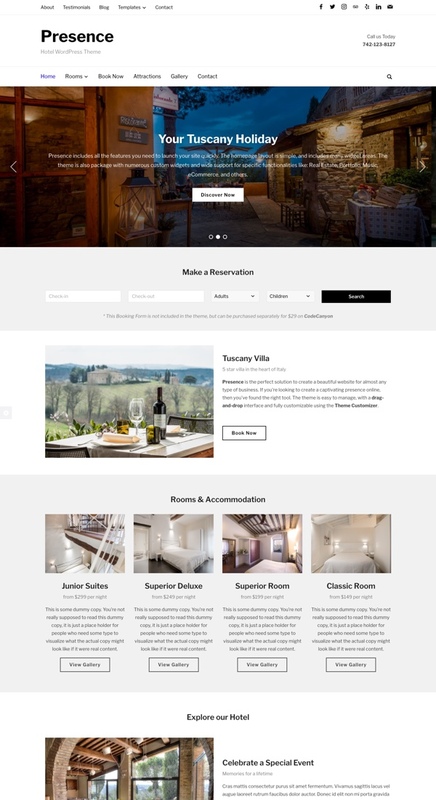 Palazio is a premium hotel WordPress theme from Hermes Themes designed for hotels, hostels, resorts, B&B’s, spas and other small business websites. The theme has a clean, neutral colour scheme and a professional design ideal for up market hotels and resorts or any accommodation provider wanting a great looking website. Majestic is a premium hotel WordPress theme with a modern design and a mobile responsive layout. The attractive theme is perfect for any type of hotel big or small, resort, B&B, guest house, spa or other hospitality business website. 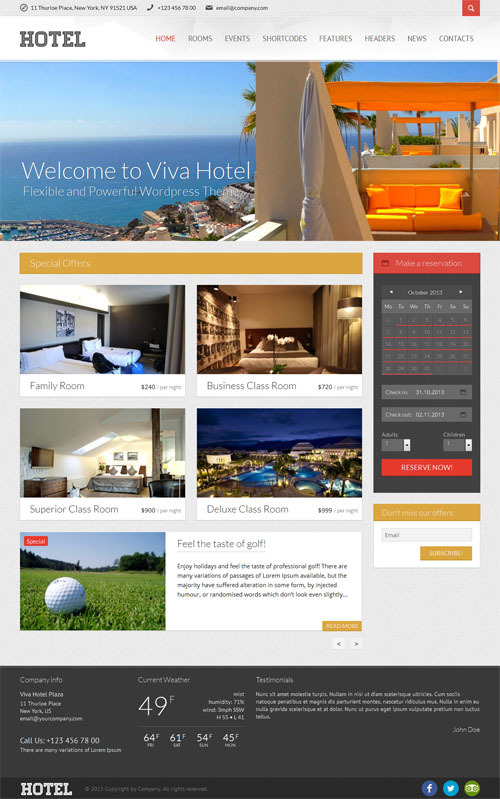 It has two colour options and includes a number of features specially required in a hotel website including custom templates for displaying information about rooms and rates, a photo gallery template, nearby attractions information template, a testimonials module, and social media integration for Facebook, TripAdvisor etc. Castello is a unique, attractive and professional WordPress theme designed specifically for hotels, resorts, guest houses, B&B’s, holiday homes and apartments, luxury villas, farm stays and other accommodation websites. The premium theme from Hermes Themes utilises full screen photos on the homepage as well for the interior pages to really stand out and engage your visitors. It has a photo gallery template, testimonials module, attractions and events module, social media integration for Facebook, TripAdvisor etc, and a rooms and rates template. As the theme was developed with vacation homes and villas in mind it has seasonal pricing functionality with the ability to define custom periods of time and set different rates for these periods. It has a simple booking form template or you can easily use a more advanced third party forms plugin or booking system. The theme is also mobile ready with a responsive design. 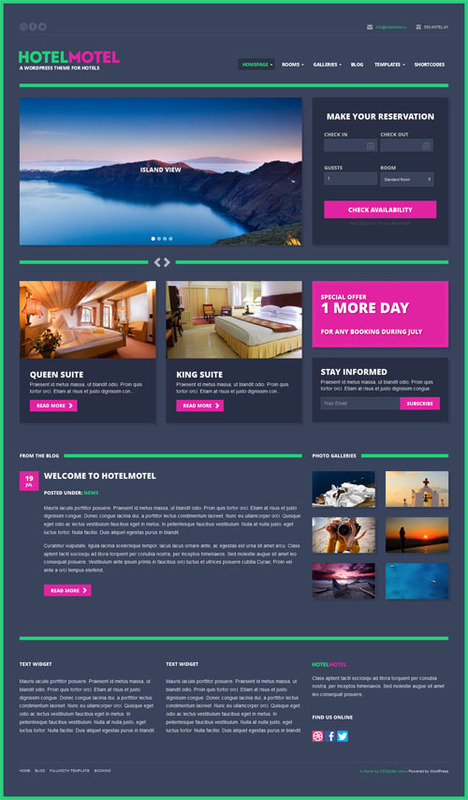 Hotel Motel is a professional, funky and mobile ready WordPress theme for hotel or motel websites. The premium WordPress theme from cssigniter has a bold and modern design that’s combined with clear and easy layout and functionality. You could use the theme for motels, resorts, hotels, bed and breakfasts (B&Bs), guest houses, or any other accommodation website. It has custom page templates for rooms, and a number of other custom templates required in a hotel website including: a booking template, contact template with map, and photo gallery templates (1,2 and 3 column layouts). The theme has a built in booking system that allows visitors to get in touch, or alternatively you can easily integrate your favourite booking system into the theme. The Soho hotel WordPress theme designed for luxury hotels, resorts, serviced arpartments, B&Bs, and other types of accommodation website. The premium theme is mobile friendly with a responsive design and has a fully functional booking system (powered by a plugin). It has PayPal payments, room availability checker, 4 colour schemes, 5 homepage styles, events and testimonials, WPML compatibility for multiple languages and more. The Anchor Inn WordPress theme is an easy to customise and fully featured WordPress theme for hotels and resorts. The premium theme has a fully responsive mobile friendly design which is also retina ready. Features include a reservation form, room pages, unlimited colour schemes, translation ready, slider, unlimited sidebars and more. HotelEngine is a theme and plugin package from Engine Themes consisting of two hotel WordPress themes and a booking plugin. The premium package includes the Comfy and the Classy hotel WordPress themes, as well as the BookingEngine plugin that provides reservation and payment processing functionality. The Classy theme and the Comfy theme have clean and modern designs that are mobile friendly. The Comfy theme has a front-page slider, while the Classy theme has a full screen hero image for a powerful impact. Both themes include 8 different colour schemes, custom room management and template with detailed room specifications and images, showcase gallery, guest testimonials, news and events sections, localisation support and more. The Booking Engine plugin is a powerful booking management solution that integrates with the hotel themes. It offers advanced booking management functionality, options to check room availability, multiple payment methods and detailed invoice and email notifications for guests. The Villa Rental theme from Templatic allows you to build a mobile friendly vacation rental booking website. The theme has a modern and fresh design and allows you to list vacation rentals and manage bookings. Its powered by Templatic’s Tevolution plugin and the Booking System add-on. Some of the key features of the theme include: custom property page that allows you to display photos, map and all information about the property, online booking functionality, widgetized homepage, extensive booking calendar, season pricing, tariff page, email management, manage taxes, multiple payment gateways, infinite colour options, multiple language support, and more. Ibiza is a versatile business WordPress theme designed for beach clubs but could also work well for resorts, hotels and other types of accommodation websites. The premium theme from 7Theme has a simple, modern and stylish design with lots of handy features. Some of the key features include: slideshows, unique content elements, team members page, pricing boxes and tables, services page, various portfolio layouts and galleries, FAQ section, history page, Google fonts, a mobile friendly responsive design and more. There are of course many other fantastic premium business WordPress themes and business portfolio WordPress themes available that could be used as a base for a professional hotel, accommodation or hospitality website with the right plugins. So the options are really not limited only to the themes above.